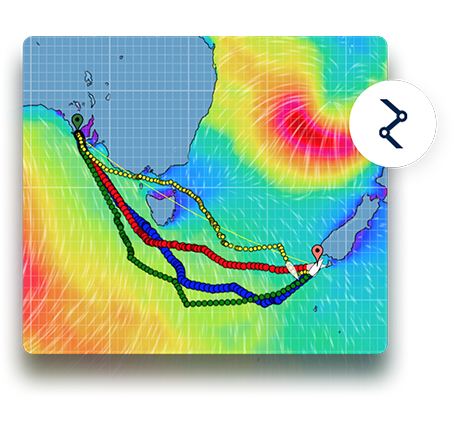 Ocean Racing & Americas Cup proven, highest resolution wind & marine forecasts on the web. 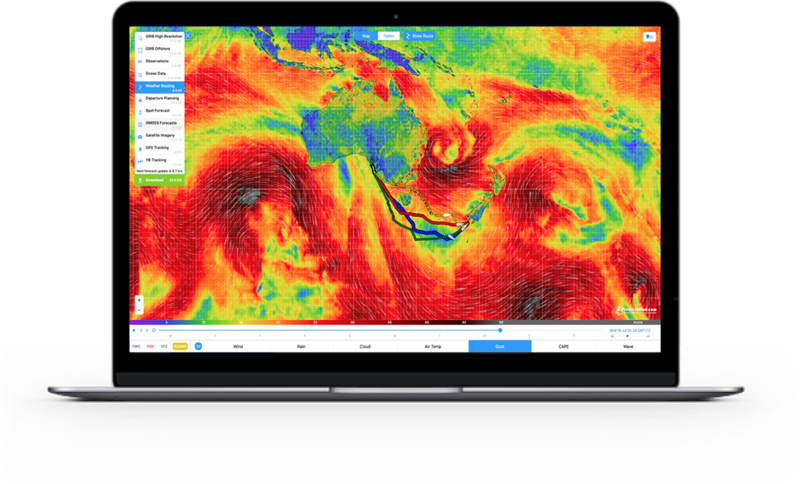 PredictWind is the only company in the world that runs their own global weather model at 50km resolution with 2 sources. In addition 1km / 8km resolution forecasts are generated for popular regions around the world. These wind & marine forecasts (PWG & PWE) can only be found at PredictWind. The best tool we have for predicting the major trends and the most accurate of the models available. If you want to be successful in racing — use PredictWind — Precise in details, Dynamic in development, Effective in delivery. I have found their service to be accurate even in the most remote regions of our planet. Intelligent, accurate, easy to use and always puts you in the right place to take best advantage of the systems. Simply Brilliant! Be alerted of specific weather conditions. Incredibly detailed wind & marine forecast maps. Up to the minute observations from thousands of stations. 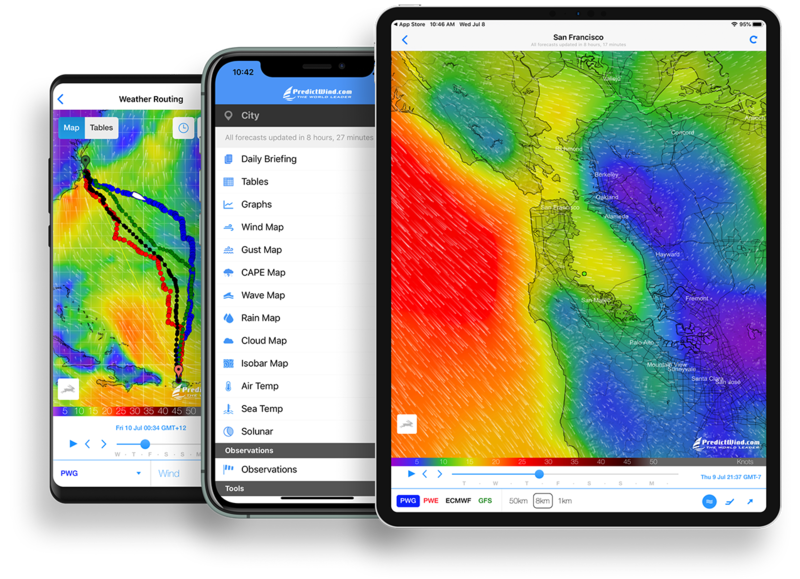 All PredictWind world leading wind forecasts and tools are available on mobile apps in addition to the forecast website. Heading on an Offshore Passage? We’ve got you covered with our accurate forecasting tools. 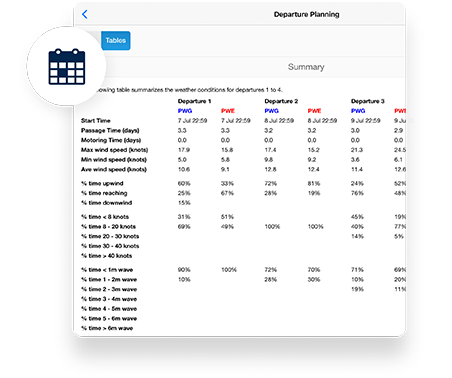 PredictWind has developed an algorithm based routing tool that uses the most accurate forecasts to give you ideal sailing routes and forecasts for your journey. Figure out the best day to depart based on the upcoming high resolution PredictWind forecasts.